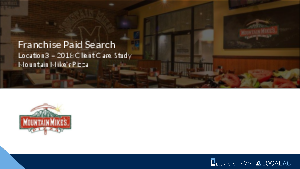 Location3 client Mountain Mike’s Pizza and their franchisees face significant competitive challenges when advertising on Google, which ultimately requires the need to be both incredibly efficient with campaign setup and incredibly precise when managing bids and local budgets. A quick Google keyword search for “pizza near me” in Mountain Mike’s home state of California yields over 58,000,000 results (“pizza delivery” yields 56,000,000) and often features a predictable set of ad results from industry giants like Domino’s and Pizza Hut, among others. Suffice it to say that buying “pizza”-related terms in AdWords can get incredibly expensive, incredibly quickly, if a local franchisee’s budgets and bids are not managed with precision. When you combine that fact with limited location-level advertising budgets, our team at Location3 was presented with a significant challenge in helping Mountain Mike’s Pizza generate increases in customer pizza orders while simultaneously ensuring that ad spend costs for all 195 franchise locations remained stable.